Take a unique trip through New Zealand with our beautiful, collectible poster cards. These truly timeless designs have been created to reflect the art deco styles of the 'twenties and 'thirties and focus on the aviation heritage and identities of places throughout the world. NEW: A3 PRINTS AVAILABLE NOW: ALL of these images are available in this larger size, as A3 - sized prints on quality acid-free art stock. They look FANTASTIC framed in groups, add colour and timeless charm to any home or office decor. We are selling these at $25.00 each. Postage is $6.00 in a mailing tube, maximum 3 per tube. Contact us direct at www.contourcreative@xtra.co.nz to order. Delivery can take up to ten days - as orders have to be supplied to us from the printer. Check out the discount rate on our Order Form for multiple orders. Trimotor over farm land in 1934. 1. An Air Travel NZ Fox Moth and Fox glacier. 2. Commemorating first flight (1920) over Mt. Cook this distinctive design features DH 4. 3 Will Scotland's pioneer flights of New Zealand are acknowledged in this depiction of Caudron G3. 4 A conversion of DH 9, the 'Limousine', was arguably NZ's first 'airliner', with seating for three passengers. 1.A beautiful New Year's day on an Auckland beach with Walsh Brother's Flying Boat. 2. A Supermarine Channel Flying Boat at the conclusion of the first flight from Auckland to Wellington in 1920. 3. Christchurch's famous cathedral with Fokker Tri Motor Southern Cross (1928). 4. A De Havilland Express flys over central Dunedin, in a design that reflects the city's Scots heritage. 1. Waitakere's Piha beach with Avro Lancastrian (1945). 2. Hamilton arches with De Havilland DH 6. 1. New Zealand Series (of 24) No.2. Kaiwaka Scene.Mustering sheep. 2. New Zealand Series (of 24) No.4. After School. 3. New Zealand Series (of 24) No.6.Dairying. 4. NZ Treasure Series No 1. Dargaville. 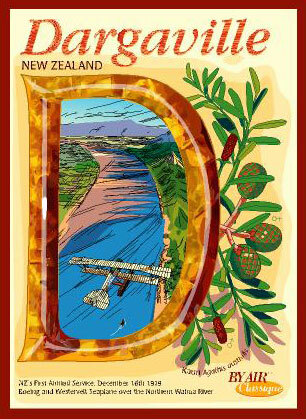 A kauri gum D frames George Bolt's Boeing over the Northern Wairoa River.